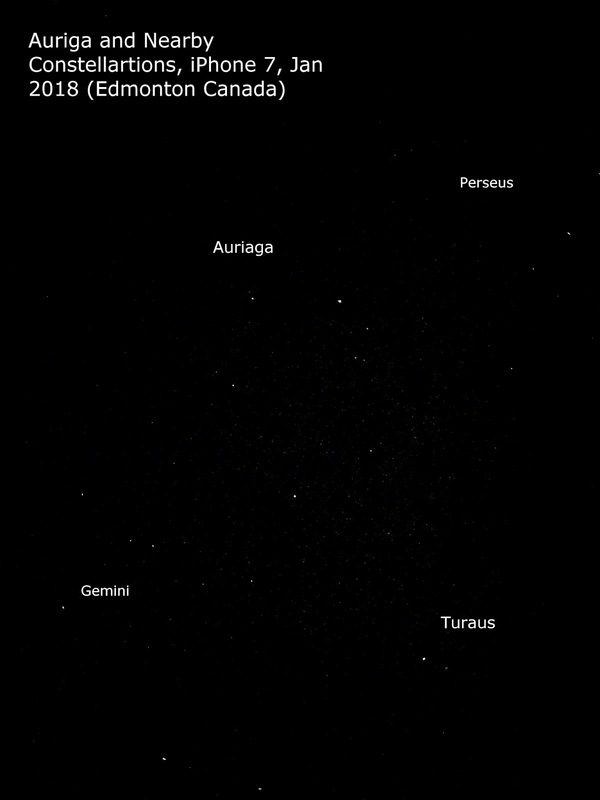 I took a few photos of the constellation Auriga and its neighboring stars recently, with my iPhone 7. Below is one of those, that has been pushed a bit in the GIMP image program, and labelled. 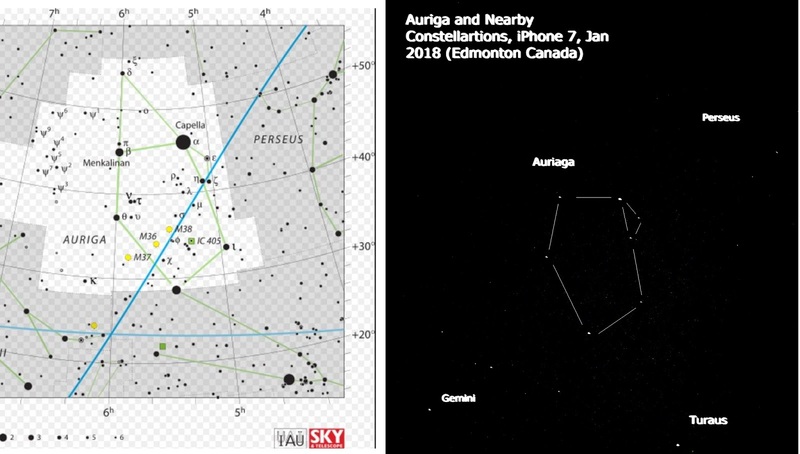 Auriga is actually pretty easy to see, on a reasonably dark night, even in the light polluted city, on a late fall or winter evening. Basically, once you have found Orion, it is straight up from there. It will therefore tend to be quite high in the sky, almost straight above at times. You really have to crane your neck at those times, and it can be awkward for telescope use, as the tube is nearly vertical. If you are fairly far south (south of 34 degrees), some of the stars will be below the horizon. So, Auriga might be somewhat overlooked because of those reasons. It is a sort of distorted pentagon shape (like the home plate on a baseball diamond), or something like a crown, as indicated in the Sky and Telescope drawing, as well as a crop from my photo, with constellation lines added. The mythical figure that is associated with Auriga in Greek mythology, is supposed to have invented the 4-horse chariot. So I suppose one could think of it in those terms too, with a little imagination. In that case, Beta would be the driver, and Theta, Cappella, Beta Tauri, and Lambda would be the horses (as seen from above). 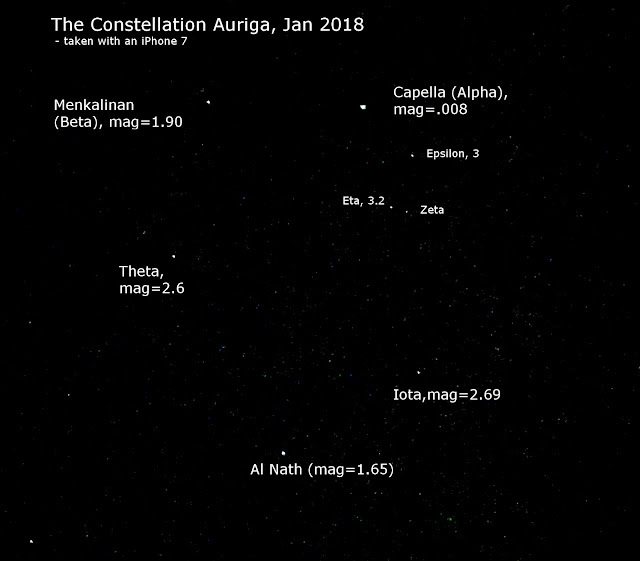 · Beta Auriga or Menkalinan: This is another bright star, at magnitude 1.9. It is about 81 light years away, and is also binary (the majority of stars are). It’s also about 2.4 times more massive than the sun. It is an A-class star. · Al Nath or Gamma Auriga (aka Beta Tauri): Technically, this star is part of Taurus, but it is “shared” with Auriga, and is one of the brighter stars of the “home plate” asterism. It is about130 light years away, a B-class star, so pretty big, with a mass 5 times our sun. · Theta Auriga: This is an A-class star, with a magnitude of about 2.6, and is about 166 light years from Earth. It is about 3.4 times the mass of the sun, and is also a binary. · Iota Auriga: It is K-class star, about 494 light years away, with a magnitude of about 2.7. It’s big, with a mass about 7 times that of the sun, and a very large radius, over 125 times that of the sun. It is thus very luminous. It may have some brown dwarf companions. · The Kids, Eplsilon, Eta and Zeta. This is a group of stars, about magnitude 3 or dimmer, not far from Capella in the sky. In mythology, these are baby goats, not human children. · The iPhone also captured some dimmer (magnitude 4 or less) stars. You can compare and contrast with the Sky and Telescope picture to look for them. It can be hard to tell, though, if the really dim points are stars that were captured by the iPhone, or optical artifacts of the camera (e.g. hot pixels, etc). Auriga is also noted for having a number of Messier objects, M36, M37, and M38. These are open clusters, containing hundreds of gravitationally bound stars, which are pretty through a good telescope, though an iPhone doesn’t pick them up. I have located them with a 130 mm Newtonian – they are well worth seeing, if you have the time and equipment. There are also a number of other open clusters. Several planets have been detected around a number of stars in Auriga, via radial velocity methods. Most have been large, Jupiter sized planets, but some smaller ones have been detected as well. Star Trek set one memorable episode on a planet in the Capella system, where McCoy got to use the immortal line “I’m a doctor, not an escalator!”. · It is easy to take pictures with an iPhone. That means it is quick and you don’t have to freeze in the cold, especially in my part of the world. · It is fascinating to see just what a “simple” camera like an iPhone (or iPad) can do, these days, especially with a bit of post processing of the images. · The iPhone sees pretty much what the human eye sees in the light polluted city, so it works well as an educational tool. Long exposure astrophotography is great, but the images don’t look much like the actual sky does, for a typical viewer. · So, it is a nice tool for introducing people to the brightest stars in the sky. And, given how ignorant most modern people are of the sky, that seems like a good thing to do. · It is good practice with Gimp or Photoshop. · It makes for a relatively easy blog, and that is a lead-in to selling books, as you can see below. Though, as any blogger will tell you, the conversion rate from blog reader to book purchaser is exceedingly low. Nonetheless, we live in hope. Now that you have read some real science (astronomy and astrophysics), you should read some science fiction. Since the blog mentioned Star Trek, here’s one with some Star Trek references (implied). Here’s a story giving a possible scenario for the so-called Zoo Hypothesis, known in Star Trek lore as the Prime Directive. It’s an explanation sometimes given to account for a mystery in the Search for Intelligent Life, known as The Great Silence, or Fermi’s Paradox. Basically, Enrico Fermi argued (quite convincingly, to many observers), that there had been ample time for an alien intelligence to colonize the galaxy since its formation, so where are they? 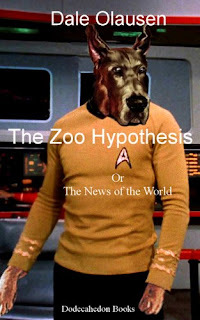 The Zoo Hypotheses says that they are out there, but have cordoned off the Earth from contact, until we are sufficiently evolved or culturally advanced to handle the impact of alien contact. This story takes a humorous tongue in cheek approach to that explanation. It also features dogs and sly references to Star Trek. Talk about man’s Best Friend.